The Hub is the control center for an intelligent home: it connects sensors, switches and thermostats. It controls all devices as the heart of a smart home. Our Hub is a compact IP smart home gateway that works with the Z-Wave wireless standard. With the Hub you control your home centrally and flexibly - without the hassle of cabling. Devices and scenes can be operated via radio switch, smartphone, desktop and tablet PC. The Hub controls within a network up to 230 Z-Wave components from different manufacturers and allows the establishment of direct links between the devices. These are then active even without the use of the gateway. The hardware of the Hub is very flexible and offers in addition to the already existing technologies WLAN and Z-Wave the possibility to integrate further technologies, such as EnOcean, via a USB port. In the development of the HUB, the focus was on ease of use and a solid security architecture. This makes the Hub one of the safest smart home gateways ever. Thanks to the integrated device database with step by step instructions, new devices can be connected quickly and easily. The Hub offers the great advantage that it is able to integrate all certified Z-Wave devices with all their functions, while other gateways suppress many functions. The Hub works with "Z-Way", the first Z-Wave Plus certified Z-Wave control software. Using so-called apps from the ever-growing App Store, you can automate your home in an instant. For example, you can switch on and off sockets on a timed basis, dim the lights in the house automatically and depending on the brightness or let your home heat to a comfortable temperature at the touch of a button. With the free Hub smartphone and tablet app, you can control your home not just from home, but also from outside. The basis for a networked smart home is a gateway that connects and controls all components as a control center. 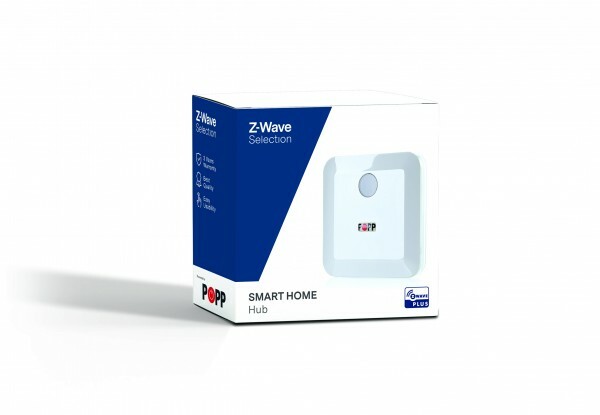 The Hub networks up to 230 Z-Wave components from different manufacturers and also allows the integration of end devices with Wi-Fi or EnOcean standard. The control panel is easy to use, offers solid data security and maximum flexibility in the integration of various components.